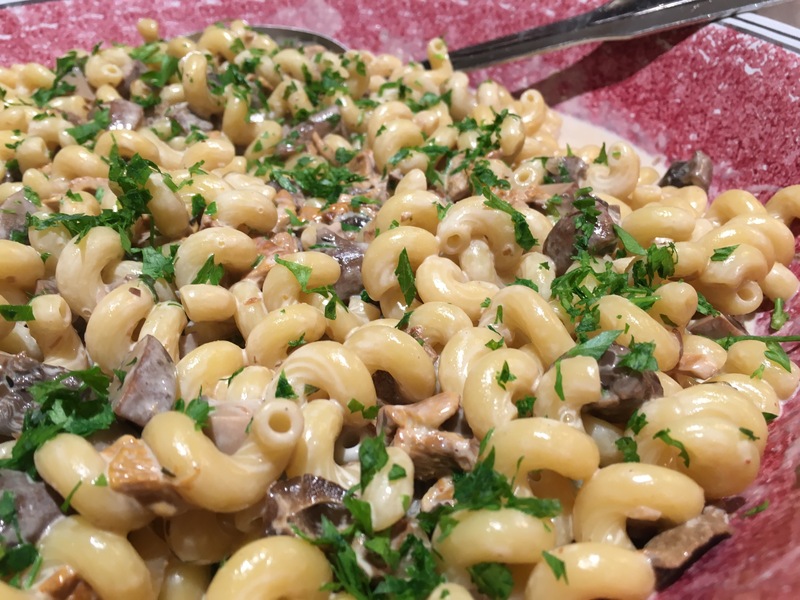 When I first began blogging I posted a recipe for pasta with a roasted mushroom cream sauce. This year I’ve modified the recipe and it is a delicious and comforting autumn pasta dish. I use three kinds of mushrooms to make a stronger mushroom-flavored sauce: cremini or baby portobellos, chanterelles, and dried porcini. It will appear that there is too much sauce to cover the pasta, but use it all as it absorbs as it sits. This is the first year we have grown shallots, and find that they are sweeter than store-bought and add a nice oniony sweetness to the sauce. Melt the butter in a 4-quart pot on medium heat. Add shallots and garlic. Sauté 5 minutes to soften. Add cremini and chanterelles, a little salt, and cook 10 minutes to soften mushrooms. While the mushrooms are cooking place dried porcini in a bowl and cover with boiling water. Let hydrate for 5 minutes. Spoon out mushrooms, save soaking liquid, and strain it. Chop up hydrated porcini. Boil pasta water and cook pasta until al dente. Add porcini and drained soaking liquid to the mushroom and shallot mixture. Cook 3 minutes. Stir in wine and bouillon cube. Cook 3 minutes. Add thyme and cream. Mix, then taste and adjust salt and pepper to your liking. Cook to heat cream, about 5 minutes. Pour sauce over cooked pasta. Garnish with parsley. Serves 6. This entry was posted in Pasta, Sauces, Vegetables, Vegetarian. Bookmark the permalink.